Two former collegiate and NFL standouts will receive major awards from the Walter Camp Foundation during its 49th Awards Weekend on January 14-16, 2016 in New Haven, Conn. Former New England Patriot standout Joe Andruzzi (Southern Connecticut State University) is the Foundation’s “Man of the Year,” and 1977 Walter Camp All-American and NFL Super Bowl champion quarterback Doug Williams (Grambling State) is the Alumni Award recipient. NFL Hall of Famer and former Oakland Raider Fred Biletnikoff (Florida State) was previously named as the Man of the Year recipient, but recent knee surgery will prohibit him from traveling to attend the Weekend festivities. 1982 Walter Camp All-American and NFL Hall of Fame running back Erik Dickerson (SMU) is unable to attend the Weekend (due to a scheduling conflict) to accept the Alumni Award. The Walter Camp Man of the Year awarded honors an individual who has been closely associated with the game of American football as a player, coach or close attendant to the game. He must have attained a measure of success and been a leader in his chosen profession. He must have contributed to the public service for the benefit of his community, country and his fellow man. He must have an impeccable reputation for integrity and must be dedicated to our American Heritage and the philosophy of Walter Camp. A native of Staten Island, N.Y., Joe was a two-time Division II All-America offensive lineman for Southern Connecticut State University, graduating in 1997 with a degree in special education. 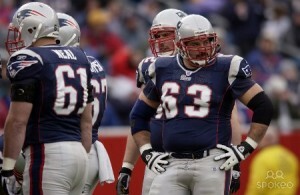 Though he went undrafted, Joe signed a professional contract with the Green Bay Packers and played in NFL Europe before being signed by the New England Patriots in 2000. Over the next five seasons, Andruzzi was a part of three Super Bowl champion teams, and became a role model and community staple in the New England area. Off the field, Joe and his wife Jen, worked tirelessly to support those in need. Joe has been recognized with the Ed Block Courage Award in 2002 and the first Ron Burton Community Service in 2003. In 2007, Joe himself needed help as he was diagnosed with non-Hodgkin’s Burkitt’s lymphoma. Following his recovery, he and his family founded the Joe Andruzzi Foundation and have been committed to tackling’s cancer’s impact by providing financial assistance for patients and their families to help them focus on recovery. In addition to his great work helping others, Joe’s personal life story is even more inspirational. His three brothers are all members of the New York City Fire Department, and all three responded to the attacks on the World Trade Center on September 11, 2001. During the 2013 Boston Marathon, Joe was able to help injured people following the bombings. Grambling State University has had one Walter Camp All-American in its illustrious football history, and quarterback Doug Williams’ 1977 campaign was one for the history books. That season, Williams passed for an NCAA-leading 3,286 yards and 38 touchdowns as the Tigers (10-1) won the Southwestern Athletic Conference title. 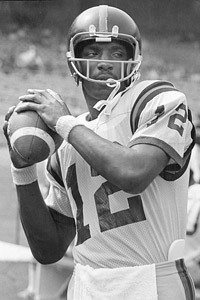 After graduating with a degree in education, Williams was drafted by the Tampa Bay Buccaneers in the first round (17th pick) of the 1978 NFL Draft. He led the Buccaneers to their first-ever NFC playoff berth in 1979. He played two seasons (1984 and 1985) the fledgling United States Football League for the Oklahoma (and then Arizona) Outlaws before returning to the NFL to play for the Washington Redskins and their new head coach Joe Gibbs. He played four seasons for the Redskins, and became the first African American quarterback to win a Super Bowl. Williams led the Redskins to Super Bowl XXII and a 42-10 victory over the Denver Broncos. In that game, Williams passed for 340 yards and four touchdowns and was named Super Bowl Most Valuable Player. Williams played 11 professional seasons, and threw for 23,755 yards and 136 touchdowns. He was named as one of the “80 Greatest Redskins” and is a member of the Redskins’ Ring of Fame and Buccaneers’ Ring of Honor. In 2001, Williams was inducted into the College Football Hall of Fame. Following his playing career, Williams coached in both the collegiate and professional ranks, including head coaching stints at Morehouse College (1997) and his alma mater Grambling State (1998-2003, 2011-13). Williams succeeded the legendary Eddie Robinson (and 1982 Walter Camp Distinguished American award recipient) and proceeded to lead the Tigers to four consecutive SWAC titles from 2000 to 2003, accumulating 40 victories during that span. Williams’ overall collegiate coaching record is 65-39, an impressive .625 winning percentage. Williams also has served in executive roles, in player personnel and collegiate and professional scouting, in the professional ranks. He currently is the Personnel Executive for the Redskins, who recently clinched the 2015 NFC East Division title. Andruzzi and Williams will be recognized at the organization’s national awards banquet, presented by First Niagara Bank, on Saturday, January 16, 2016 at the Yale University Commons in New Haven. In addition to the 2015 Walter Camp All-America team and Player of the Year Derrick Henry (RB, Alabama). In addition to Andruzzi and Williams, the Foundation will recognize Special Olympics CEO Tim Shriver as its Distinguished American.